St. Vincent was born of poor parents in the village of Pouy in Gascony, France, about 1580. He enjoyed his first schooling under the Franciscan Fathers at Acqs. 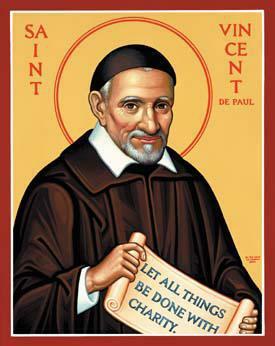 In 1596, he went to the University of Toulouse to study theology and there he was ordained priest in 1600. In 1605, on a voyage by sea from Marseilles to Narbonne, he was captured by African pirates and was carried as a slave to Tunis. Two years later he managed to escape. After a brief visit to Rome he returned to France, where he became taught the children in the family of Emmanuel de Gondy, a General of the galleys of France. In 1617, St Vincent began to preach missions. It would be impossible to write here everything he achieved but his main work was charity. He included everyone from poor children to the old and needy while at the same time serving God. He died in Paris at the age of 80. It was in this same City in 1833 that a group of students founded the Society of St Vincent de Paul where they put their faith into action by helping the poor, just as Pope Francis asks us to do today. Patron: of Charities, Hospitals, Leprosy and many more! Thérèse was born in France in 1873, one of five daughters born to a mother who had wanted to be a saint and a father who had wanted to be monk. Sadly, her mother died of breast cancer when she was four and a half years old. Her sixteen year old sister Pauline became her second mother -which made the second loss even worse when Pauline entered the Carmelite convent five years later. A few months after that, Thérèse became so ill with a fever that people thought she was dying. Thérèse wanted to enter the Carmelite convent to join her sisters Pauline and Marie and eventually Thérèse was admitted . She once said, "Love proves itself by deeds, so how am I to show my love? Great deeds are forbidden me. The only way I can prove my love is by scattering flowers and these flowers are every little sacrifice, every glance and word, and the doing of the least actions for love." She took every chance to sacrifice, no matter how small it would seem. She smiled at the sisters she didn't like. She ate everything she was given without complaining - so that she was often given the worst leftovers. Once she was accused of breaking a vase when she was not at fault. Instead of arguing she sank to her knees and begged forgiveness. These little sacrifices cost her more than bigger ones, for these went unrecognized by others. No one told her how wonderful she was for these little secret humiliations and good deeds. In 1896, Thérèse coughed up blood. She kept working without telling anyone until she became so sick a year later everyone knew it. Worst of all she had lost her joy and confidence and felt she would die young without leaving anything behind. Pauline had already had her writing down her memories for journal and now she wanted her to continue - so they would have something to circulate on her life after her death. Her pain was great but she tried to remain smiling and cheerful-and succeeded so well that some thought she was only pretending to be ill. She died on September 30, 1897 at the age of 24 years old. 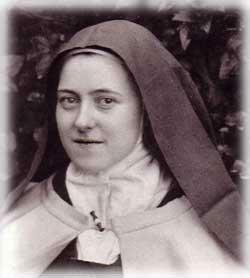 Her sister Pauline put together Thérèse's writings and sent 2000 copies to other convents. Therese's "little way" of trusting in Jesus to make her holy and relying on small daily sacrifices instead of great deeds appealed to the thousands of Catholics and others who were trying to find holiness in ordinary lives. Thérèse of Lisieux is one of the patron saints of the missions, not because she ever went anywhere, but because of her special love of the missions, and the prayers and letters she gave in support of missionaries. This is reminder to all of us who feel we can do nothing, that it is the little things that keep God's kingdom growing. Patron: of Missionaries; France; Russia; HIV/AIDS Sufferers; Florists and Gardeners; Loss of Parents; Tuberculosis. 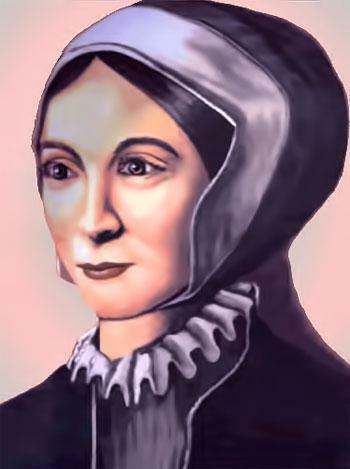 Margaret was a daughter of Thomas Middleton, Sheriff of York (1564-5), a wax-chandler and she married John Clitherow, a wealthy butcher and a chamberlain of the city, in St. Martin's church, Coney St. on 8 July, 1571, and lived in the Shambles, a street you can still visit in York. She converted to the Catholic Faith about three years later and often risked her life by hiding and looking after priests. She was frequently imprisoned, sometimes for two years at a time. Finally, she was arrested on 10 March, 1586 and she was committed to the castle. On 14 March, she was brought before the court in York assizes and charged with hiding priests and hearing Mass. She refused to plead, since the only witnesses against her would be her own little children and servants, whom she could not bear to involve in the guilt of her death. She was therefore condemned to be pressed to death. "God be thanked, I am not worthy of so good a death as this", she said. On the day of her execution, 25 March 1586 she walked barefooted to the tollbooth on Ouse Bridge, for she had sent her hose and shoes to her daughter Anne. She was urged to confess her crimes but responded, "No, no, Mr. Sheriff, I die for the love of my Lord Jesu". She was laid on the ground, a sharp stone beneath her back, her hands stretched out in the form of a cross and bound to two posts. Then a door was placed upon her, which was weighted down till she was crushed to death. Her last words were "Jesu! Jesu! Jesu! have mercy on me!" Her right hand is preserved at St. Mary's Convent, York, but the resting-place of her sacred body is not known. Her sons Henry and William became priests, and her daughter Anne a nun at St. Ursula's, Louvain. St Margaret Clitherow is often called the ‘Pearl of York’ and you can still visit a little shrine in The Shambles today. Patron: of Martyrs, Business Women, Converts, Martyrs and the Catholic Women’s League. 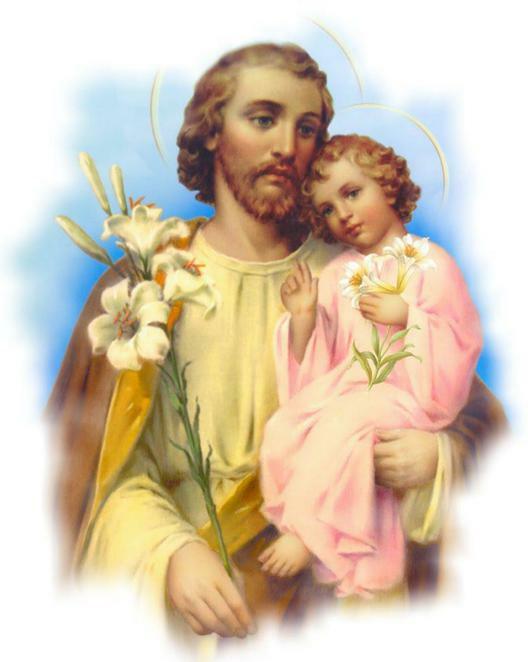 What little we know about St Joseph, the foster father to Jesus and husband to Mary, comes from the Bible. He was descended from royalty and we can trace his family back to King David; when the angel who first tells Joseph about Jesus greets him as "son of David," a royal title used also for Jesus. He was a compassionate, caring man. When he discovered Mary was pregnant after they had been betrothed, he knew the child was not his but was as yet unaware that she was carrying the Son of God. He planned to divorce Mary according to the law but he was concerned for her suffering and safety. He knew that women accused to adultery could be stoned to death, so he decided to divorce her quietly and not expose her to shame or cruelty (Matthew 1:19-25). Joseph was man of faith, obedient to whatever God asked of him without knowing the outcome. When the angel came to Joseph in a dream and told him the truth about the child Mary was carrying, Joseph immediately and without question or concern for gossip, took Mary as his wife. When the angel came again to tell him that his family was in danger, he immediately left everything he owned, all his family and friends, and fled to a strange country with his young wife and the baby. He waited in Egypt without question until the angel told him it was safe to go back (Matthew 2:13-23). We know Joseph respected God. He followed God's commands in handling the situation with. W e are told that he took his family to Jerusalem every year for Passover, something that could not have been easy for a working man. Since Joseph does not appear in Jesus' public life, at his death, or resurrection, many historians believe Joseph probably had died before Jesus started his public ministry. There is much we wish we could know about Joseph -- where and when he was born, how he spent his days, when and how he died. But Scripture has left us with the most important knowledge: who he was "a righteous man" (Matthew 1:18). Feast Days: March 19 for Joseph the Husband of Mary and May 1 for Joseph the Worker. Patron: of the Dying, the Universal Church, Fathers, Carpenters, and Social Justice.